The WSN430 open node is a WSN430 node based on a low power MSP430-based platform, with a fully functional ISM radio interface and a set of standard sensors. Concerning the radio, two versions are developed: version 1.3b presents an open 868 MHz radio interface while version 1.4 has an IEEE 802.15.4 radio interface at 2.4 GHz. 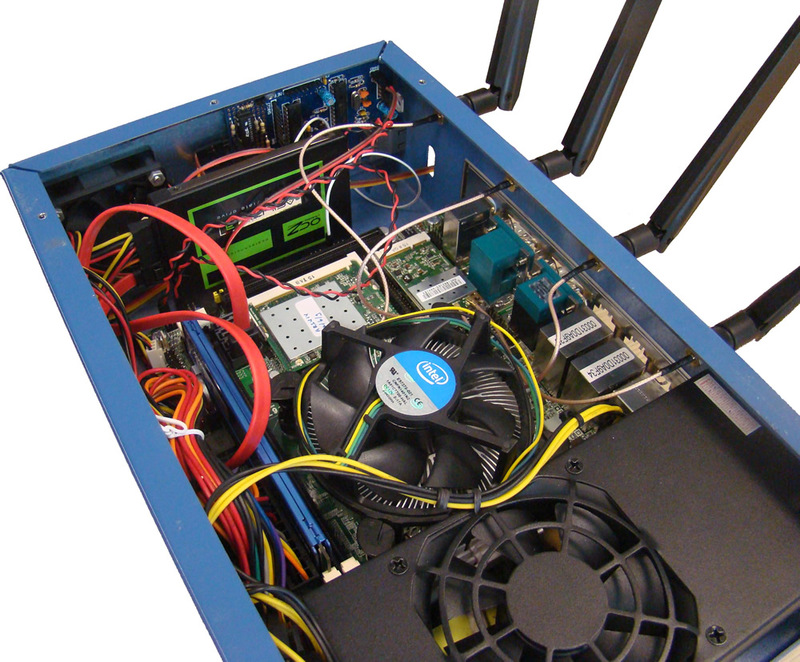 The A8 open node is the most powerful IoT-LAB node and allows to run high-level OS like Linux. 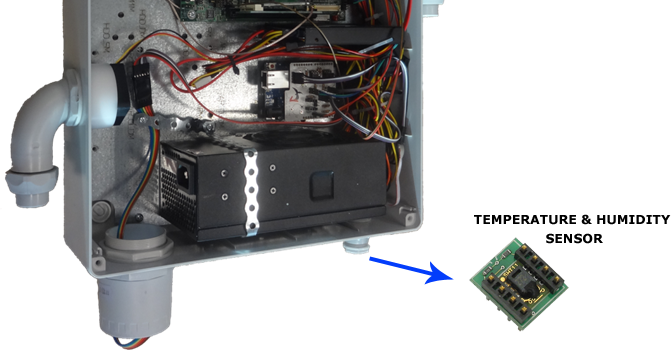 The main processor is a TI SITARA AM3505 (Arm Cortex A8) combined with a STM32 micro-controller and a radio interface. It enables to run applications used in advanced devices such as set-top box or smartphone/tablet in order to concentrate sensors information coming from a wireless sensor network. The M3 open node is based on a STM32 (ARM Cortex M3) micro-controller. Like the WSN node this next generation contains a set of sensors and a radio interface. Main evolutions are a more powerfull 32-bits processing, a new ATMEL radio interface in 2.4 Hz and more sensors. 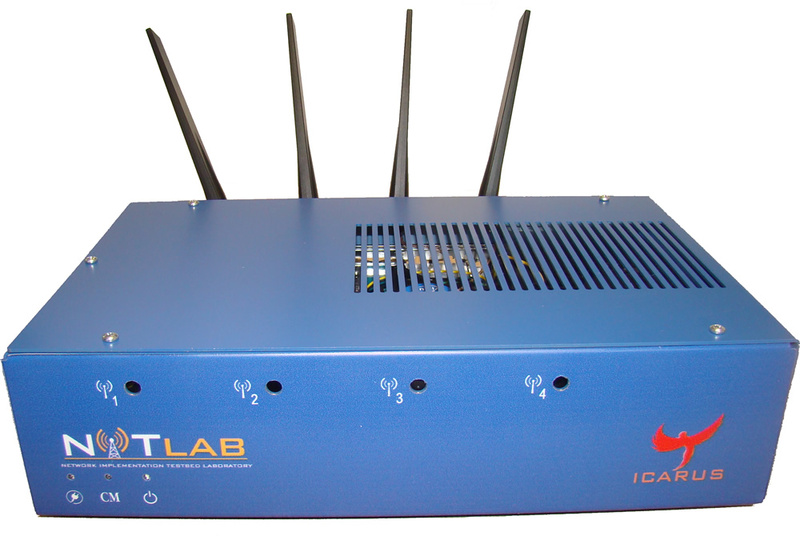 Each router is equipped with three IEEE 802.11a/b/g network interface cards (NICs). Currently, we use one LogiLink WL0025 dongle based on the RT2501U architecture with an RT2571W BB/MAC IC and RT2528 RF IC. This NIC features an on-board R-SMA connector and a 4 dBi Hi-Gain antenna. The antennas are mounted at the side panels of the router using extension cables. 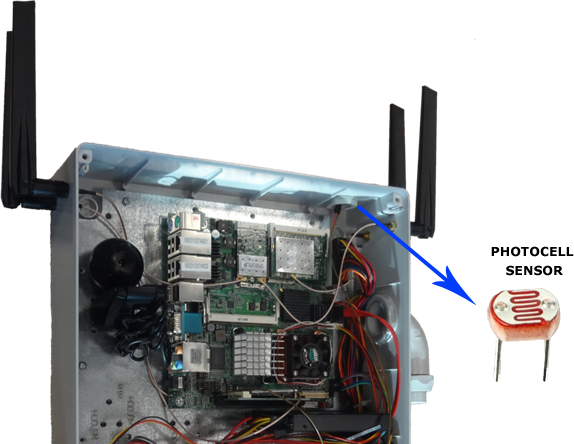 Additionally, all mesh routers are equipped with two Atheros-based MiniPCI cards (WLM54SAG) connected with dual-band antennasThe indoor nodes use a custom case that is manufactured at Freie Universität Berlin. Each mesh router is equipped with a MSB-A2 sensor node (developed at Freie Universität Berlin) that is connected via a USB cable which provides power supply and is used to write firmware images to the flash memory. The MSB-A2 sensor nodes use an LPC2387 microcontroller produced by NXP Semiconductors. The frequency of the 32-bit ARM7 TDMI-S core based microcontroller can be dynamically configured at runtime to up to 72 MHz, depending on the sensor network application and energy requirements. 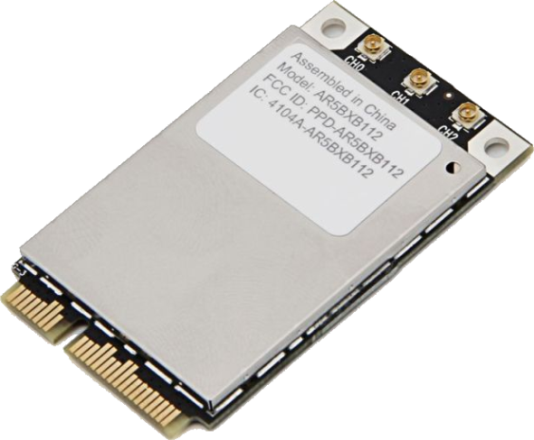 The TI (formerly Chipcon) CC1100 transceiver uses the ISM band at 863 to 870 MHz with a maximum data rate of 500 kbit/s. The MSB-A2 nodes set up a wireless testbed in parallel to the mesh routers that is fully orthogonal to the frequency band used by IEEE 802.11. The sensor nodes are equipped with a Sensirion SHT-11 temperature and humidity sensor. Depending on the experiment scenario, extensions are connected on-demand via the general purpose input/output pins (GPIO) or the second on-board mini USB port. In addition to the internal 512 KiB flash memory, microSD-cards can be used. Unlimited data storage is available via the Ethernet backbone provided by the mesh routers. 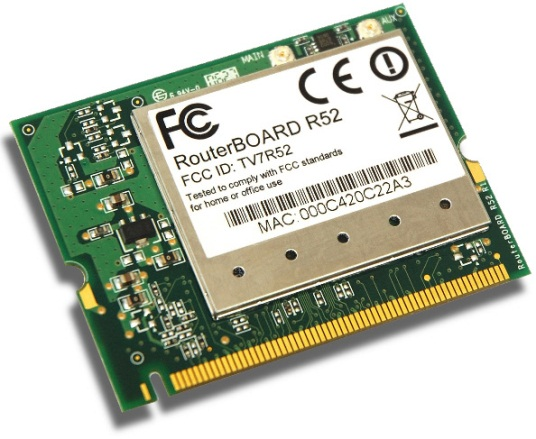 AR9380 is the single-chip, dual-band (2.4/5 GHz), 3-stream 11n solution with PCIe interface. It packs the breakthrough Signal Sustain Technology 3 (SST3) technology that enhances the rate-over-range (RoR) performance. SST3 is a set of advanced technologies and features enabled by 802.11n including LDPC, TxBF and MLD. 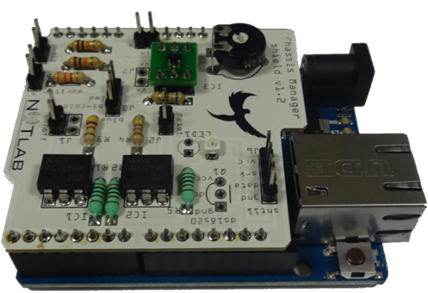 This interface runs the Atheros ath9k driver which is included in the open-source compat-wireless drivers. It features the Atheros AR5414 chipset with Turbo/Super G (air rate 108Mbps on 802.11g 2.4GHz). R52 works on 2.312-2.499 and 4.920-6.100GHz frequency range. It runs the Atheros ath5k driver which is included in the open-source compat-wireless drivers, as well as the MadWifi driver. 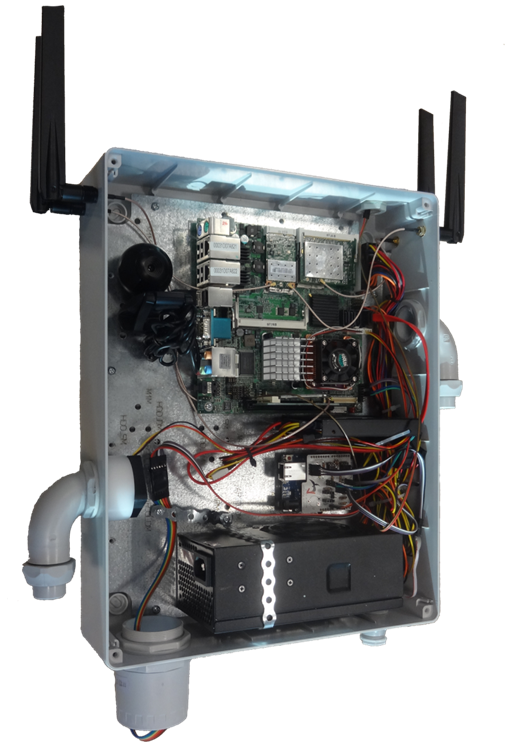 The upgraded Outdoor Nodes have been developed by the NITLab team and support MIMO operation. The new version of the Outdoor Nodes are equipped with 802.11a/b/g and 802.11a/b/g/n wireless interfaces. They also feature 2-core Intel cpus, new generation solid state drives and usb web cameras. Last but not least, each node is equipped with light, temperature and humidity sensors. In order to control and monitor Outdoor nodes' operation, we use NITlab's Chassis Manager Card (CM card). A tiny web server is running on the CM card and serves http requests, such as power on/off and reset commands. Further more, CM card can support real time sensor measurements, since it can be connected with temperature & humidity sensors, as well as with light sensors. Two leds are used to indicate the operational status of the outdoor nodes. More specifically a two state led, located on the side, indicates the power status of the node. If the led is red the node is turned off and if the led is blue the node is turned on. The same led flashes in red mode each time the cm card serves a request. The second led is on the cm card and indicates the connection of the node to the power supply. 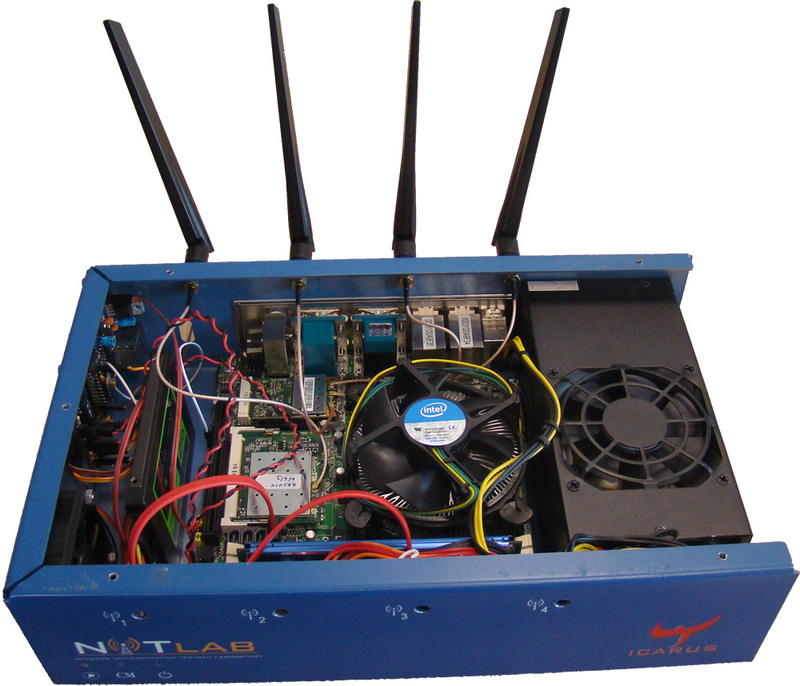 NITlab has developed powerful Wi-Fi nodes, called ICARUS, in order to support the increasing demand of state-of-the-art resources for experimentation in NITOS facility. Experimenters are able to run and evaluate demanding processing algorithms and protocols in a large scale testbed. Icarus nodes are equipped with 802.11a/b/g and 802.11a/b/g/n wireless interfaces and feature new generation intel 4-core cpu's and new generation solid state drives. 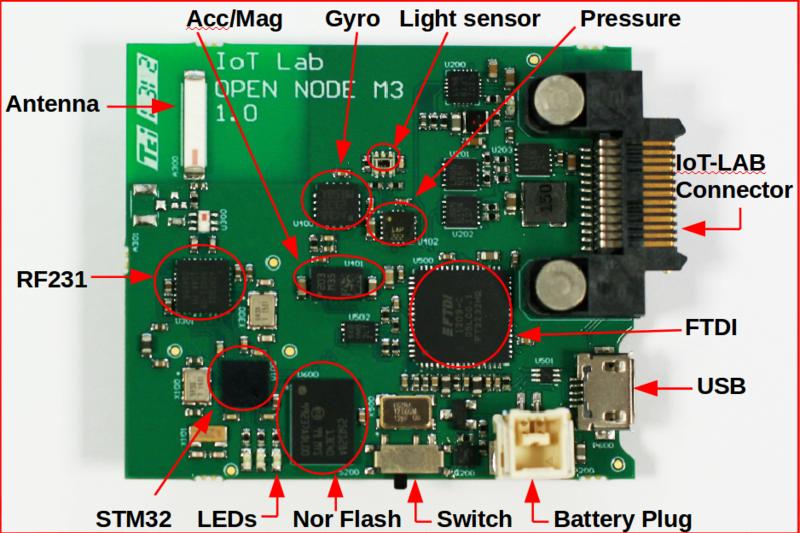 The SAMR21 open node is based on an Atmel SAM R21 Xplained Pro evaluation kit built on top of an Atmel ARM Cortex M0 micro-controller. This new open node also contains an IEEE 802.15.4 Atmel radio interface at 2.4 GHz. 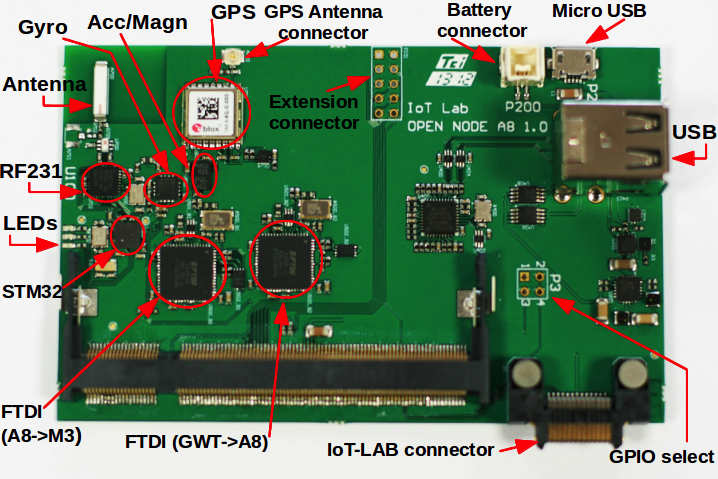 The SAMR21 Open Node can reset, debug and program the ARM Cortex M0 through the embedded debugger (EDBG) connected to the gateway USB port. This component also allows a UART connection to the M0. The input power source is configured through the power management. The serial connection baudrate should be configured at 115200 bauds in the firmware.